This blog post is part of the Suicide Prevention Awareness Month blog tour, which began in 2016 at Dear Debt in order to bring the personal finance community together to talk about something taboo: debt, depression, and suicide. You can read more about Dear Debt, support the volunteer-run project, and read other participants’ posts here. I am republishing my debt stigma post from last year below. Debt is stupid. I’m just going to say it: debt, itself, is stupid. When I say that, I don’t mean people who have debt are stupid, or the reasons they got into debt are stupid (although sometimes that happens; we’ve all probably fallen into some fugly fashion trend once or twice and bought it on credit). And yes, before you lecture me: I am in debt, I accept responsibility for the debt I’m in and I don’t expect “the taxpayers” to bail me out. As a personal finance blogger who specifically blogs about paying off student loan debt, you’d think I would have a great handle on my own finances, right? I mean, if I can’t figure it out, how can anyone else who doesn’t understand personal finances? But that’s the thing: unless you make a ton of money and understand personal finance (and then can pay off all your debt quickly), debt is a burden that many of us, bloggers or not, struggle with. It seems like you make really good progress on paying off debt and then suddenly you’re hit with a really pricey car bill. You can have a budget and still have debt. You can stick to your budget plan and still have debt. The two are not mutually exclusive. You can gain alternative options to finance VAT debt, but sometimes even that creates even more problems later down the line. Even if they acknowledge it, debt still really isn’t addressed. When people discuss debt, it’s usually referenced as some sort of personal failing. Like, why can’t you pay off your debt? It’s easy. Make money, pay off your debt. Duh. Plus, we’ve all heard it before: pay off your debt! Live within your means! When I went to college, I worked in the summers and didn’t have any debt! Why aren’t you saving for retirement? Yeah, cool, thanks for the lecture on how you worked as a server at Red Robin and graduated with no debt. How much did a semester cost at your school? Oh, $1,000? Cool, mine was $15,000. I’d have to be a high-paid stripper to make that kind of money, and let’s all be honest, I would be a terrible stripper. All of this talk in the media and even among dinner tables is enough to make us feel like we’re alone and worthless because we can’t pay off debt. Combine these feelings with modern day stresses like finding the “right” job, the “right” partner, living some kind of cool life (whatever that means), and just finding time (and money) to spend time with friends is enough to stress anyone out. 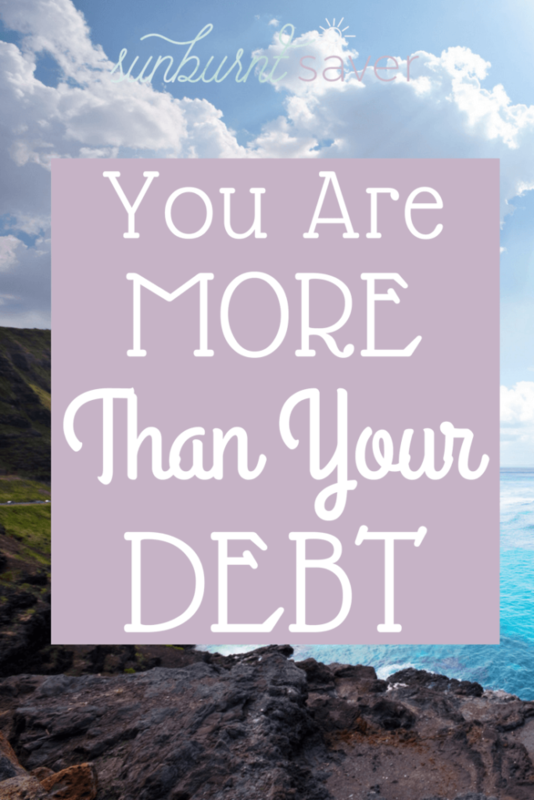 I’ve been in this position: feeling like you’re in so much debt that you are worthless. When you’re looking at student loan debt, especially big debt that keeps growing because you can’t afford to pay the principal and interest, it can feel absolutely insurmountable. Add in anything else you’d like to have as an adult, like a wedding, house, or even a pet, and you can start feeling really guilty: I don’t deserve a spouse/house/dog, I’m not paying enough on my student loans! I’ll never get ahead! I should just move in with my parents and funnel everything toward debt. Struggling to pay off your student loans? Check out this post on options for student loan repayment. You Know What? Who Cares! But here’s the thing: if you can’t pay off your debt right away… who cares? In the grand scope of things, who really cares if you slowly and steadily pay off your debt as you can, enjoy your life, and slowly but consistently save for retirement? Who cares if sometimes it’s not consistent debt repayment and looks more like a sporadic shot of payment with a few months of pennies? Who cares if you decide to try and consolidate your debts into one payment by looking at somewhere like https://debtconsolidation.loans/ for a debt consolidation loan? To the naysayers: YES, we will end up paying more in interest. Yes, maybe the government ends up paying off a part of our student loans because it really does take us 10-25 years to pay back our debt. But other than that… having debt is just something people have. You’re not worthless if you have debt. I’m not worthless. I might have felt like crap a few months ago, but now I really am just like #YOLO. If you’re doing your best to pay off your debt, it’s no one’s freaking business how you do it. Put yourself on a budget, earn more money on the side, and keep hustling to your budget and life goals. Like everything tough in life, you’ll get through it. We’ll get through it. I know it seems like it is. I’ve been through depression and had those thoughts too. I didn’t want to share I’ve had those feelings, but I had them pretty recently. Depression does not define you and neither does your debt. It takes a lot to work through those thoughts, but one thing that helped me is to create a budget, earn more money, and remind myself that people out there care. If no one else would care, I care. I care if you feel worthless, like your debt is more than you are as a human. If you’re struggling, there’s a list of resources below I really encourage you to visit or call. But I was there. I felt like even calling the Suicide Hotline wasn’t worth it because who cares about me? But a ton of people do care. I’m not a mental health counselor at all and please, seriously, reach out to the Suicide Hotline because they absolutely care about you. But also know that you will make it through this. Your debt is stupid and the universe doesn’t care about your debt, it cares about you. You’re not stupid or worthless. You’ll get through this. We’ll get through this. Please reach out to the links below if you’re struggling to pay off debt or contemplating suicide. Special thanks to Jackie at Jackie Beck for this excellent list of resources. (United States) Crisis Textline: text START to 741-741.